Religious life is very much alive! We are breaking boundaries in our society, and in the world. We continue to invite young women to join the mission. And we Sisters of Providence are excited to see a new wave of young people seeking something more. 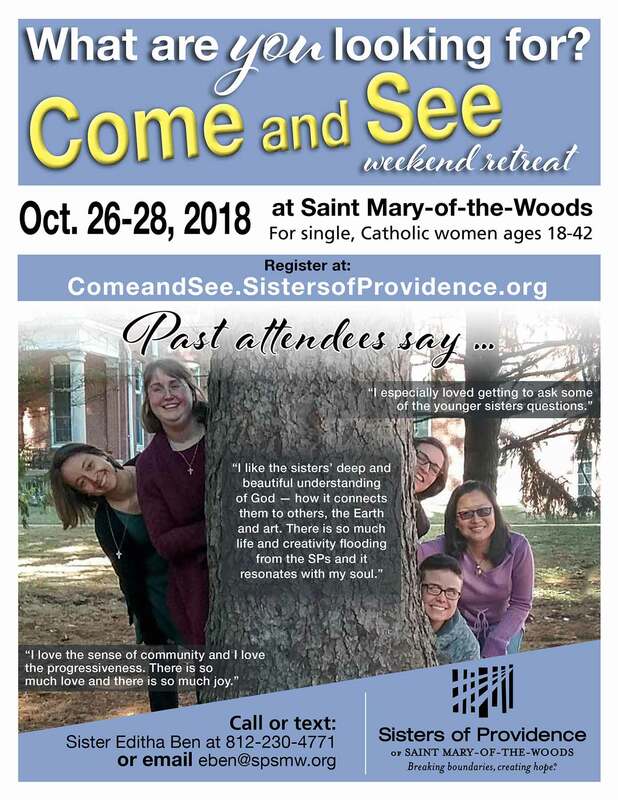 Twice a year, in the spring and in the fall, the sisters invite single, Catholic women ages 18-42 to attend a Come and See weekend retreat to explore if life as a Sister of Providence might be for them. This past April, we had 17 women attend the Come and See retreat! We were ecstatic at the great amount of interest. We were also impressed with the women who attended and what they had to say. Why did they come? Here are some of their reasons. What did the women say they enjoyed about the weekend? Our next Come and See weekend is Oct. 26-28 at Saint Mary-of-the-Woods. Please help us spread the word! Invite women you know who are exploring possibilities for their lives. Find out more at ComeandSee.SistersofProvidence.org You can also find a flyer you can print and post here. Thank you for helping us share our joy with others! Sister Editha Ben currently ministers as a member of the new membership team, encouraging women to consider life as a Sister of Providence.